Drivers with Aspergers like to have every detail in place in accordance with their personal preferences. They want to precisely change things like the climate control and the radio. These changes allow for comfort and, therefore, enjoyment while driving. Purchase a solar shield that specifically fits the car and use the air conditioning during the hot days. Anybody, especially an Aspergers driver who has sensory hypersensitivity, could not bear to sit in a car with an excessively hot interior. During the warmer weather, use a solar shield and crank up the air conditioning to eliminate stifling heat; then drive when the inside cools down. The opposites apply to cold weather. Study the car and determine where all of the switches and buttons are so that the driver can quickly adjust while driving. It always helps to know where to find all of the specific gizmos in a car so that the driver can push the buttons without looking at them for more than a split second. Further, such features on the dashboard particularly intrigue Aspergers drivers, considering that they always feel compelled to know EVERY detail about their vehicle. 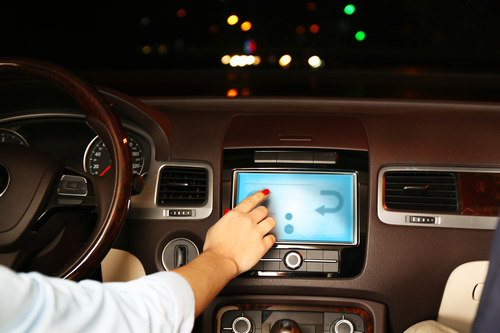 Simply allow the driver to examine the car’s interior and to experiment with all of the various gizmos. Aspergers youth process information differently than their neuro-typical peers. More specifically, they generally think in a visual, concrete, detail-oriented manner for every task. They like to know every detail about something, especially when it is critical to survival and to excellence at a given task; driving encompasses both survival and excellence. Driver’s education courses and books serve as necessary and insightful preparatory activities for the inexperienced and exceptional driver. Further, each driver has different habits and preferences, good and bad. When a driver or parent uses these habits advantageously, they serve as indicators for level of comfort and as foreshadowers of future mistakes. 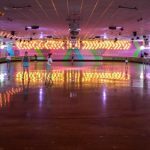 Among the most common and serious issues that Aspergers youth face is the fact that many of them do not always think fast enough to make snap decisions. This issue especially applies when Aspergers drivers travel in unfamiliar places in general. 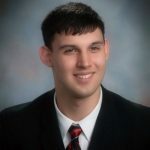 For example: an Aspergers driver who usually travels on two-lane in-state roadways near his home would likely have trouble navigating through a series of one-way city streets in Baltimore, MD, considering that he does not typically watch out for one-way signs there. As a safeguard, they desire to stick with the same few routes every day because they fit into their pre-established driving parameters. 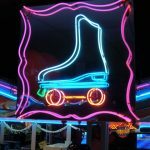 These parameters could include the avoidance of bridges due to fear of heights or bumpy roads due to sensory overload caused by bouncing in the seat. Let’s face it, unpleasant stimulation and loss of direction often triggers meltdowns and panic attacks in the Aspergers driver, thereby further clouding his judgment. Behind the wheel, one bad situation leads to another. 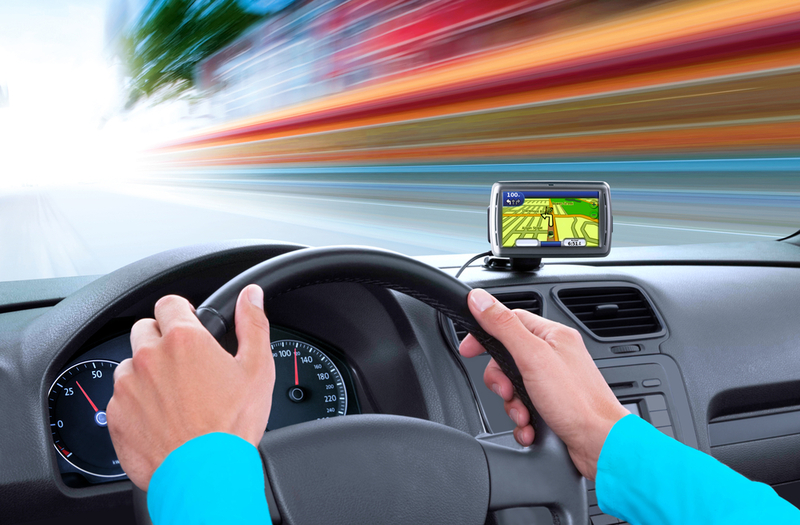 To resolve these issues, there are actions that parents and Aspergers drivers can both take to make judgment clear in order to ensure safe travels. 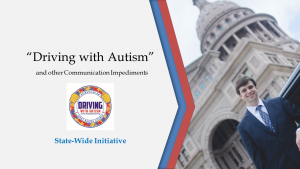 Driving with Autism statewide initiative. Over 25 law enforcement agencies were represented as well as city officials. 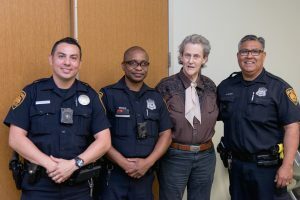 All came together to hear about the new Texas driver license restriction code, Communication Impediment with a Peace Officer and how that may look in a pull-over scenario. Though Dr. Grandin’s plane was delayed, she made her entrance to speak to the officers just as the luncheon drew to a close..a great way to end on a high note! Jennifer and Samuel Allen present understanding Autism and those with a communication challenge. 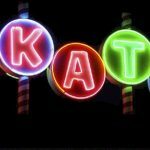 Want to be a part of something big? Aspergers101 has come so far with our Driving with Autism initiative. 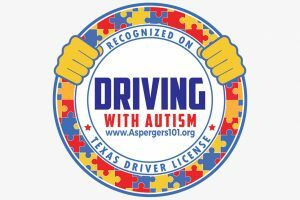 Now we need to get the word out about the opportunities available for Texas drivers with Autism, and we need your help. 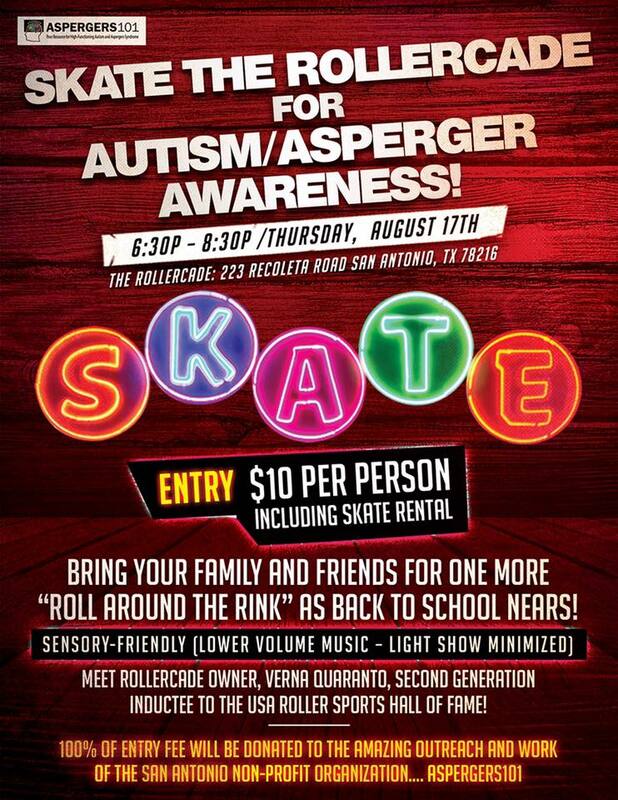 We’re raising funds for the awareness of the new Texas “Driving with Autism” initiative! This program informs and trains law enforcement on best practices for handling people with a Communication Impediment such as Autism, Aspergers, brain injury, Parkinson, deafness and in some cases, Down Syndrome. Your contribution will help us place these informative brochures and posters into every high school, library, and Autism organization across the state. 100% of the funds raised will go toward printing and mailing costs. We have come so far but we are on our own in funding these crucial resources. If you believe in what we do and would like to help Aspergers101 in our groundbreaking Driving with Autism initiative, please consider donating today. My son, Sam, has a form of High Functioning Autism called Aspergers Syndrome. 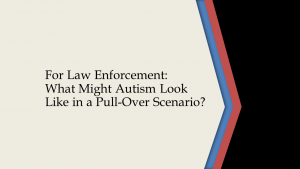 We embarked on a program to help those with Autism and other communication impediments drive without fear from a law enforcement encounter. The Texas DPS responded by stepping up and providing “Communication Impediment with a Peace Officer” directly on your driver license or Texas ID. 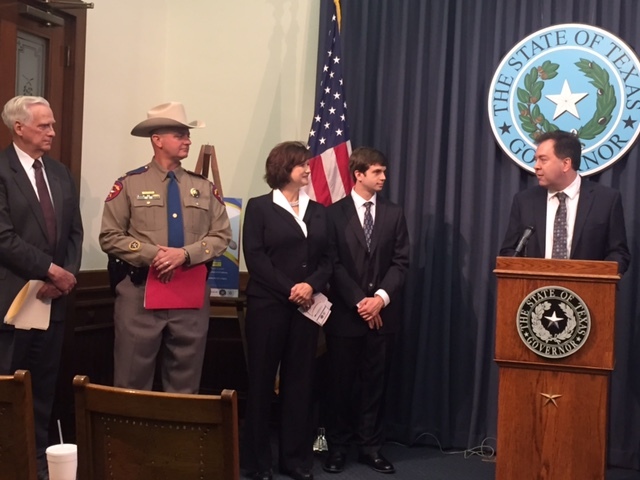 In addition, we have teamed up to provide new Texas Trooper Recruits training when encountering those with Autism. It’s working! We are now in production for video reenactments showing what “Autism” may look like in a pull over situation. These will be made available to law enforcement state-wide! 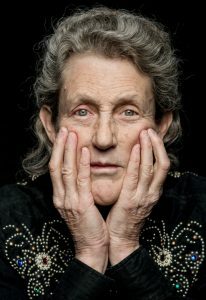 Now we have brochures and posters outlining how to get the new driver license restriction code, as well as informative tips from Autistic expert, Dr. Temple Grandin. These will be distributed to High Schools and education centers (free) statewide. 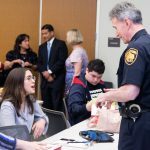 AUSTIN – The Texas Department of Public Safety (DPS), along with the Texas Governor’s Committee on People with Disabilities and Aspergers101, today announced initiatives designed to assist Texans who have communication impairments. 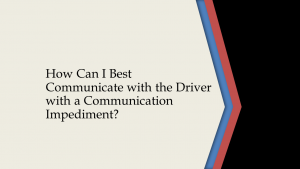 In an effort to facilitate effective communication, DPS first reminded Texans of the communication impediment option that drivers may select to be reflected on their driver licenses/ID cards. (L to R) Mr. Joe Peters/Asst Director Texas DPS Driver License Division, Major Jason Hester/Texas DPS Education, Training Division, Jennifer Allen/CEO Aspergers101, Samuel Allen/Aspergers101 and speaking, Mr. Ron Lucey/Executive Director Texas Governors Committee on People with Disabilities. 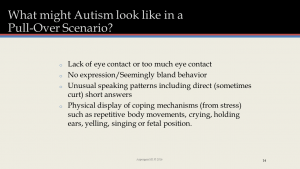 DPS also announced that it has recently coordinated with Aspergers101 to allow them to provide training and education to DPS officers about autism spectrum disorders, other disabilities and potential communications challenges associated with those disorders. 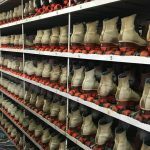 In addition, the department announced that it is working with Aspergers101 to develop a Driving With Autism camp that will help increase driver confidence and practical skills. 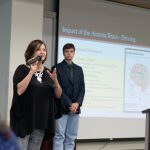 The Texas Department of Public Safety will begin training officers on how to interact with people with autism, one of several initiatives the agency announced Monday to help with traffic stops involving motorists with communication difficulties. The agency also will expand the definition of “communication impediment,” a notation that appears on driver licenses if a person chooses. The notation previously was aimed at protecting deaf people, but now will be available for those on the autism spectrum. Maj. Jason Hester, of the DPS Education, Training and Research Division, said the department did not see a specific need for the program before being approached by Aspergers101, an advocacy group on the communication impediment. 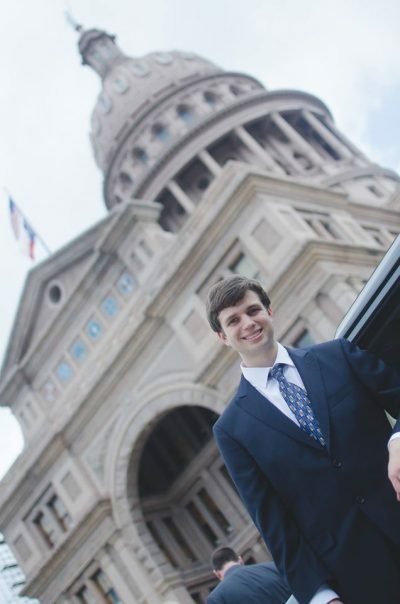 Samuel Allen, who is 21 and has autism, said people with communication impediments may not understand figures of speech and could react to a police officer in a way that he could see as disrespectful. 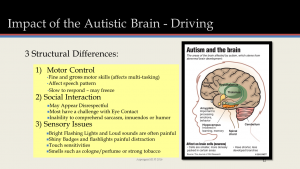 Aspergers101 also is collaborating with the agency in providing “Driving with Autism” summer camps to help people with communication difficulties learn how to drive and interact with police officers.